The original H2O Mop has been redesigned and improved with the new H2O Mop Ultra. It is now a 3-in-1 cleaning solution that allows it work as a floor steamer, carpet steamer, and a handheld steamer all in one. It is a lean, mean, cleaning machine that unleashes the dirt devouring and sanitizing power of steam. The H2O Mop Ultra is designed to thoroughly clean different types of floor surfaces. Use it on marble, ceramic, stone, linoleum, sealed hardwood floor, parquet and more. 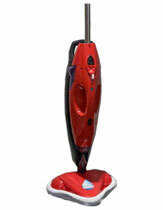 With the included Carpet Glider you can instantly convert the H2O Mop to a carpet cleaner. It steam cleans your carpet, eliminates odors, and kills germs. Just detach the steam generator from the base and the unit becomes a powerful hand-held steamer. Use it to cut through baked on oven messes, sanitize kid’s toys, blast away dirt, steam clean your blinds, and more. You can order H2O Mop Ultra for 3 easy payments of $33.33 plus the cost of shipping and handling. As a special bonus you can get a free Microfiber Miracle Cleaning Kit with your order if you pay the extra shipping. It includes 3 cloths and 1 mit. 5 Comments on "H2O Mop Ultra"
Do you have a special of buy one get on free or is it with some other mop? how are the payments billed and what about purchasing acces. You can choose from 3 monthly payments of $33.33 or a single payments of $99.99. You can purcahse different accessories directly from the company or buy them at other online retailers like Amazon. I ordered the H2O Mop Ultra Model SC-393 a while back and have enjoyed it very much. Unfortunately the peice broke off that cleans the floor and (the bottom part where it moves around). I would like to know if that piece (which I believe would have to be the whole section) can be replaced?